The Yankees entered their contest against the Chicago White Sox Tuesday night having lost 10 of their last 15 games. With the team in the midst of their toughest stretch of the season and having suffered a rash of recent injuries, the Yankees looked to Luis Severino to build on the strong work of Jordan Montgomery on Monday night. Severino faced off against White Sox ace Jose Quintana in a matchup that saw both pitchers hold down the opposing offenses. After that it became a battle of the bullpens which got interesting for both teams but in the end the Yankees' bullpen was just too depleted to hang on to this one. The first seven innings of this game were very boring and frustrating to watch, but not for the same reasons that have plagued the team recently. The Yankees’ pitching has been struggling but Luis Severino delivered a good start Tuesday night, pitching seven innings and allowing just one run. It seemed like he was pitching with runners on base all night but only he scattered six hits while striking out 12 and walking none. Severino was able to work out of a few jams and keep the team in the game early but he went to another level at the end of it, retiring the last six batters he faced in a row and striking out the side in the seventh inning. The White Sox were able to get to Severino just once in the bottom of the third inning. A leadoff single by Kevan Smith and a single by Yolmer Sanchez were mixed in with a strikeout and a fly out to set the stage for Jose Abreu with two out and two on base. Abreu was able to come through for the White Sox, sticking the bat out and shooting a double down the right field line to score Smith. Severino worked out of the jam without further trouble for his only damage of the night. 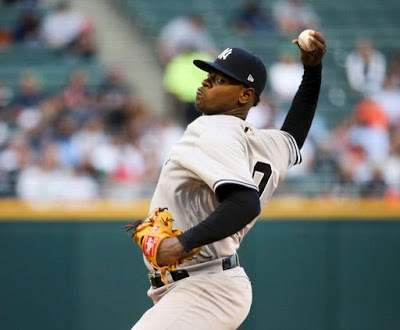 His counterpart Quintana matched Severino in stifling the Yankees injury depleted lineup, shutting them out through 6.1 innings while allowing only two hits and walking four. They didn’t have many chances off of Quintana but the Yankees failed to capitalize on the few chances they had. They stranded runners on second and third with two outs in the fourth following a walk by Gary Sanchez and a single by Didi Gregorius. They failed to push across a runner in scoring position again the 6th when Aaron Judge was stranded at second base following a double. That was about all the Yankees could muster off of Quintana. He issued a one out walk in the seventh which ended his night but Anthony Swarzak emerged from the bullpen and promptly got Ronald Torreyes to ground into an inning ending double play. Quintana may have walked four batters but other than that his stuff was plenty good enough tonight. The Yankees did not have many good at bats off of him and they were clearly off balance all night. Although Quintana held them down, this Yankee team has proven that they do not give up and tonight was no exception. Former Yankee farmhand Tommy Kahnle began the eighth inning and with one out faced new arrival Tyler Wade with the bases empty. In his first major league at bat Wade earned a walk that would jump start a Yankee rally. Jacoby Ellsbury then hit a dribbler past the mound for an infield single followed a by a strikeout by Chase Headley right after. That brought up Aaron Judge with two on base and Judge came through yet again with a game tying RBI single. The very next batter Gary Sanchez put the team over the top with a two run double to right center field. Didi Gregorius added an infield single before new White Sox pitcher Dan Jennings ended the inning. The Yankees jumped on top in the top of the eighth but the bottom of the eighth is when things got really interesting. In what was perhaps a vote of no confidence in the struggling Tyler Clippard, Joe Girardi began the inning with rookie Domingo German. If nothing else, this was an indication of how thin the Yankees’ bullpen is these days. With Betances and Chapman both having worked the last two days in a row Girardi opted for German who walked the first two batters of the inning and was removed for Clippard. I know everyone’s hearts went into their throats at this point. The first batter he faced was Melky Cabrera who didn’t even need to bother bunting the runners over because Clippard threw a wild pitch and did it for him. He then walked Cabrera to load the bases with no one out for Jose Abreu. At this point Clippard buckled down, striking out Abreu before getting a fly out from Avisail Garcia. Clippard then walked Todd Frazier to force in a run before striking out Matt Davidson to escape the jam and preserve the lead. Clippard has had a really tough go of it lately but this was a huge spot for him and he was able to come through. Hopefully it gets him back on track. Dellin Betances took the mound for the ninth seeking to close out the game for the Yankees but it was clear from the start that Dellin didn't have it tonight. After retiring the leadoff batter, Betances walked the next two batters and hit a third to load the bases with one out. After retiring Melky Cabrera, Betances allowed a two run, walk off single to Jose Abreu. The Yankees and the White Sox will play the third game of this four game set tomorrow night with the first pitch scheduled for 8:10pm on the YES Network. The probable starters are Masahiro Tanaka (5-7, 5.74 ERA) for the Yankees facing off against Carlos Rodon making his season debut for the White Sox.